The Yoga & Life Coaching Retreat is a 3-day retreat where we will help you live like how you feel on your yoga mat—centered, aligned and filled with joy. This retreat is the beginning of your journey in getting to know your self better, falling in love with yourself and making your extraordinary life happen. Aside from body-heart-and-mind opening yoga classes with Corey Wills, nourishing meals prepared by raw food chef, Mona Lisa Neuboeck, and a fun time with an amazing group of like-minded individuals, you will be guided to identify the vision for your life and take the first steps to making it a reality. 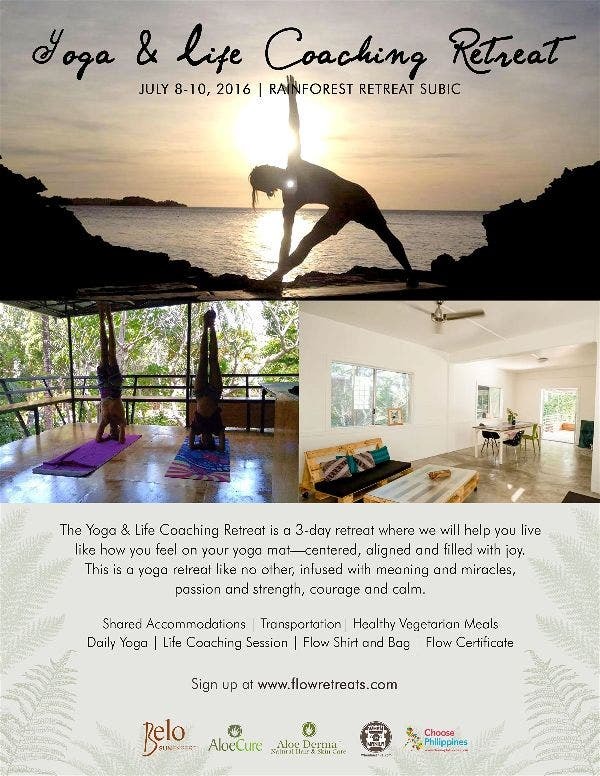 With one life coaching session, an essential book that you get to keep and refer to over and over again, a workbook to help you identify what matters most and a special package on future coaching sessions, the Life Coaching Yoga Retreat will support you in making courageous choices as you enter back into the world after the retreat. This is a yoga retreat like no other, infused with meaning and miracles, passion and strength, courage and calm. Simple, eco-minded accommodation surrounded by lush rainforest, where families of monkeys are frequent visitors, fruit bats make their home in nearby trees and where the forest creatures combine to perform their nightly symphony. This former US Navy house is renovated with the environment in mind – solar power, natural lighting, passive cooling and green living roof are slowly being installed with the aim of minimising our carbon footprint. A well-equipped kitchen, dining area and private terrace overlooking the rainforest make for great entertainment. Help yourself to the herbs in the organic garden for your meals although are fields are currently resting from several seasons of growing.